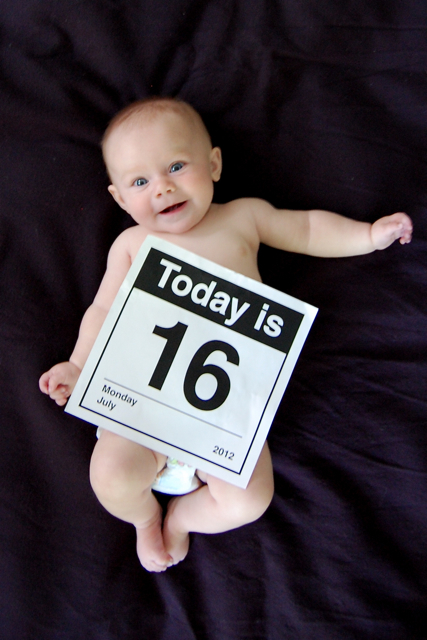 This baby is already five (almost six) months old. Just thought you should know, because I personally can't wrap my brain around it. Each month, I take a bit of time to add notes to a document that I keep in my email 'drafts' folder, for easy access. I write about anything I can think of. Things I'll add to his baby book, which I've semi-prepared to make things easy and to ensure that I won't put it off forever. This month, he started eating baby food. He dipped his toes in the ocean. I nursed him while we watched the Olympics. Time goes so fast, new mommas. I know that you might not feel like you have a spare minute to work on that baby book right now, but trust me ... someday you will. Take a second to write down the little things you want to remember right now and keep it somewhere that will be easy to find. Or email yourself, like I do. You'll be so happy you did.